Now that the heavy clearance has been done it is possible to properly look at this section of towpath and canal to see what work needs to be done. One very obvious challenge is that the towpath is divided into two where a section has collapsed and washed away into the adjacent mill stream, meaning that we presently have two dead-end paths. We are already looking at how this obstruction can be overcome so that walkers can use this lovely section of towpath once more. A view across the collapsed towpath near Alton, photographed during the WRG NW weekend 8-9 December 2018. The concrete pipe in the centre foreground previously carried water overflowing from the canal but the land around this has washed away due to lack of maintenance. Photo © Steve Wood, CUCT. Our work party last month explored a little more of the spill weir and over the weekend our WRG friends winched out tree roots around the structure, meaning that we can start to plan a more comprehensive excavation of the structure. Before this can be done, however, we will be consulting archaeologists to take advice on how best to proceed. 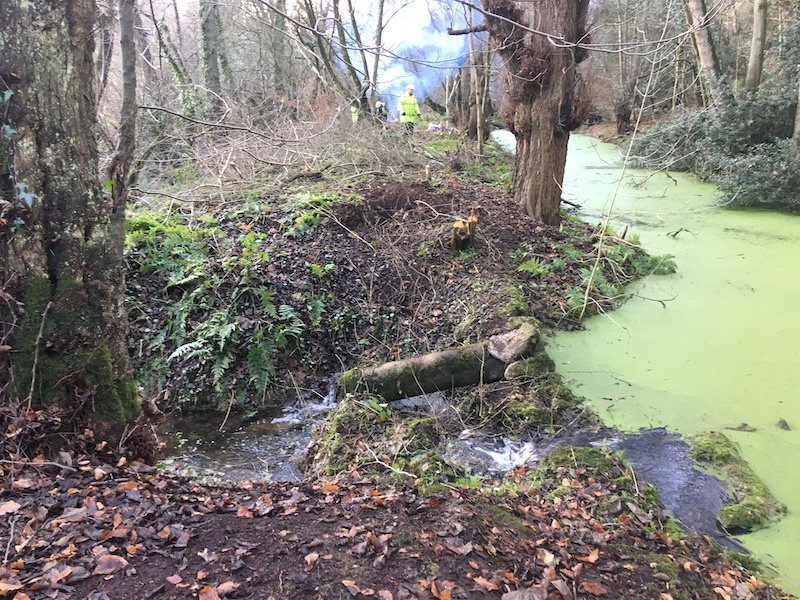 This month's work party aims to complete vegetation clearance work in the same area worked on over the weekend, from the Alton end of the site as far as the collapsed section. We will mostly be using loppers and bowsaws, and building a bonfire if the weather permits. Those travelling by public transport can meet either at 9:30 in the car park at Denstone Village Hall or 10:00 at Alton. We meet near to Alton Station, on Farley Lane. For those using satnav, put in ST10 4BY. There is parking off-road down a slope parallel to the former railway, opposite the station and we meet by the gate onto the line, which is now a public path. Please do not use the parking area on top of the bridge, as this is used by Landmark Trust guests. If anyone needs more detailed directions please get in touch. I would like to take this opportunity to thank all our volunteers and supporters for their help and encouragement this year. We are still a relatively small group but have again made significant progress over the past 12 months. I wish you all a Merry Christmas and hope to see some of you at our first work party of the New Year on 10th January.